Broom maker Carole Morse with a student in one of Foxfire’s many Heritage Skills classes. You heard right – we’re very excited to announce a full slate of Heritage Skills class offerings for 2018! We’ve been (somewhat) quietly testing the waters with a handful of classes this past year. In doing so, we learned a few things, worked out some kinks, and fine tuned our process. The results of this experience has put us in a position to develop a schedule and get it posted so folks can start making plans now. Currently, we have 35 classes and demonstrations scheduled for the coming year. Additionally, we know we will be adding to this schedule as more instructors come onboard. 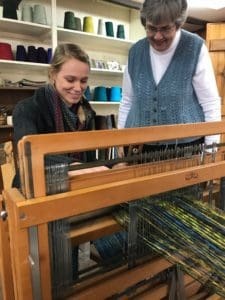 The Village Weaver, Sharon Grist, giving a weaving lesson to our assistant curator, Kami Ahrens. 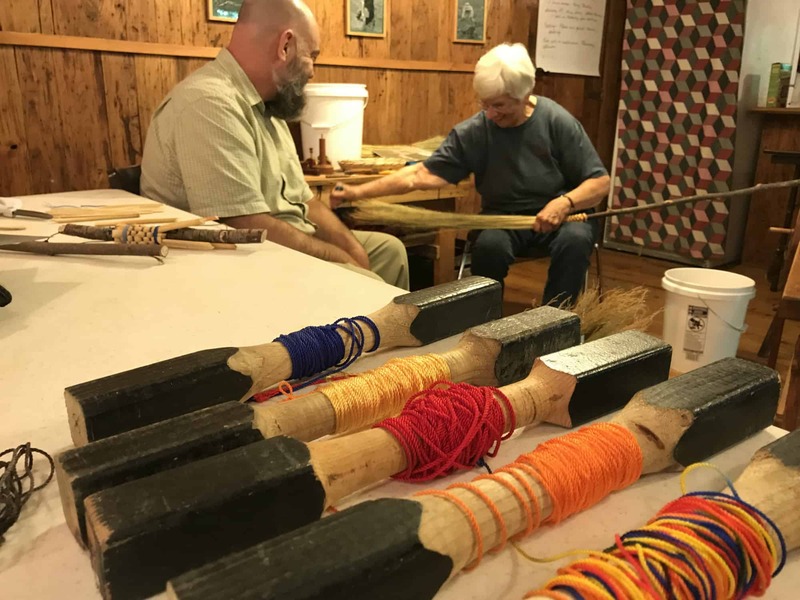 This year’s class offerings include courses on weaving, spinning, broom making, soap making, organic planting and gardening, medicinal plants, and chair bottoming with additional demonstrations in everything from natural wool dyes to open hearth cooking. One of our goals was to make these classes as accessible and affordable as we can while still fairly compensating our artists for their valuable skills and being respectful of their time. All of our instructors are working artists and professionals, some have studio spaces here on The Land, and we hope to add more spaces in order to attract new instructors for future offerings. With all that in mind, most of our classes take place on Fridays and/or Saturdays, most run from 9:30 am to 3 or 4 in the afternoon, and all are reasonably priced. Along with the classes, we will also be holding special scheduled demonstrations and popup demos throughout the year. Currently, we have scheduled four medicinal plant walks with herbalist Patricia Kyritsi Howell, beginning in June. These walks will be held on the third Thursday of the month at 1 pm and will be free with regular admission. We have also planned around four dye pot days with Sharon Grist that will also be free with regular admission. The dates and times on these demonstrations will be announced soon, but will most likely begin in June as dye plants are harvested. For summaries on our classes and our instructors, please visit our new Heritage Skills webpage, here. You can also view descriptions and purchase tickets for all of our classes at our Eventbrite page, here. Finally, for a .pdf printout of our current schedule, click here. If you have any questions about upcoming classes, please email us at foxfire@foxfire.org. We look forward to seeing you on The Land this coming year! and returning to Africa to begin a boarding school for females. I had seven volumes of the Foxfire series from my parent home that I was cleaning out. I gave them to these woman, explaining that these books could be a template for them to use to preserve the culture that would be disappearing because of the changes in the life and society. I hope it worked. Now I am cleaning out another home and found 4 volumes of the Foxfire Series. Can you suggest were it could donate them to be used for the same purpose?